The museum is housed in the Asaad Bassili Pasha Palace - an architectural monument in its own right. Inside the splendid white Italian-style palace of the late Egyptian lumber trader Bassili Pasha, a collection of 1,800 objects is now on display. Basil Pasha palace hosts Alexandria National Museum. A beautiful statue of a lady. The National Museum of Alexandria is located on Tariq El-Horreyya (or Fouad Street, as it was called before the 1952 Revolution). The objects span the numerous transformations of Alexandria from its humble beginnings in Pharaonic times to its development by Alexander the Great and through to the Islamic period under Mohamed Ali. To harmonies the museum's interior design and the artifacts on display, Italian designer Maurizzo De Paulo created sophisticated hanging diagonal showcases in which the artifacts are suspended. He painted the walls in each section of the museum in a different colour in order to create a suitable ethereal ambiance for each. The artifacts are exhibited chronologically as one ascends from one floor to the next, and a hall in the basement has been transformed into an audio-visual workshop where visitors can tour the museum via computer programs that display each item from a variety of angles along with appropriate identification. The old garage of the building has been converted into a lecture hall and there is an open air theatre for evening performances. Construction on the site was first undertaken in 1926. The Palace covers an area of 3,480 square meters. It is a white Italian-style museum sits in an expansive garden of rare trees and plants. The palace consists of four floors and an underground shelter, which was used during air raids during war. The Palace was designed by a French engineer who used the Italian styles in its construction. 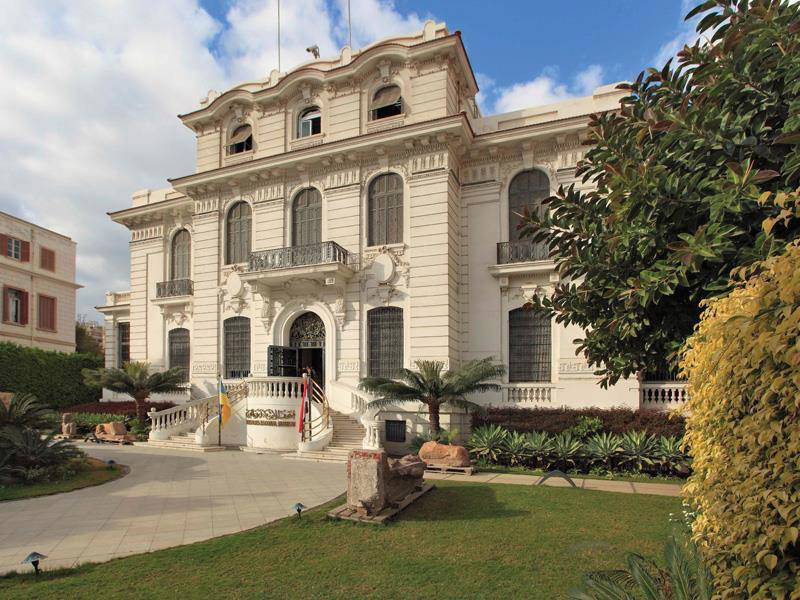 His three-storey palace was attracting the upper class people of Egyptian society, including notables such as Egypt's former Prime Ministers Ismail Sedqi Pasha and Ali Maher Pasha, and many others. This villa Sold first to the American Consulate in 1960, in 1997 the Ministry of Culture bought this real estate for about LE12 million. You will find the philosophy of colours appears in interior design. As, you will notice The Pharaonic section features a dark blue wall representing the journey to an eternal afterlife, while the Graeco-Roman objects are set against a sky-blue (marble colour) backdrop, reflecting romance and lust for life. As Copts and Muslims share beliefs concerning heaven, the sections reserved for artifacts from these religious traditions were painted green. Also, you will notice that the museum's collection has never been exhibited before. The pieces were previously in storage in various museums, the Egyptian, Coptic and Islamic in Cairo, and the Graeco-Roman and Jewellery museums in Alexandria. For example, a statue of the Roman Emperor Hadrian; a red granite statue of Emperor Caracala; a head of statue of the Pharaonic King Akhenaton (Amenhotep IV) and head for Pharaonic queen Hatshepsut, Female Pharaoh of Egypt, and 162 gold and silver Islamic and Graeco-Roman coins minted in Alexandria, also, artifacts from the sunken site of Heracleion include the famous Stele of Heracleion and a 2,20m statue of a Ptolemaic Queen dressed as Isis. From Alexandria's Eastern Harbour are displayed the Priest of Osiris holding a canopic jar and two sphinxes, one of which is a representation of Ptolemy XII, father to the Great Cleopatra VII. Other exhibits include ritual offerings, utensils, gold and jewellery. In addition to a replica of a tomb, similar to those in the Valley of the Kings at Luxor, contain one mummy with genuine funerary furniture. Canopic jars, anthropoid sarcophagi containing mummies, ushabti figures and the deceased's private possessions are all part of this mise-en-scène that offers a snapshot of the Ancient Egyptian world-view of burial and the afterlife.